Tip 1: Include the message "You make my heart flutter!" Tip 2: Glue the heart butterfly paper craft to the front of a folded over piece of construction paper or a doily to make a cute Valentine's Day card. Tip 3: Purchase fancy paper from the scrapbooking store and print the B&W version onto this for an extra fancy Heart Animal. Tip 4: Scotch tape a straw or popsicle stick to the bottom to make a butterfly puppet. Tip 6: Cut construction paper into 4 inch wide strips as long as you can make them. Tape two together to make even longer. Measure around child's head to make a construction paper 'crown'. Glue Heart Animal to front of the crown to make a Valentine's Day hat. Color (if making the black and white craft). To make a wing, glue the very large, large and medium hearts inside one another. Repeat for the second wing. To make the body, stack the smallest hearts one on top of another and glue together. Position so the hearts are all upside down. Glue the heart with the face onto the top of the body so it's right side up. 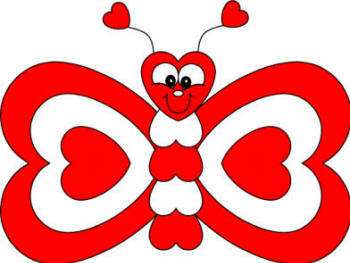 If doing on a card or background, add the two tiny hearts over the head and draw a line to make the antenna. If not doing on a background, just skip the antenna. Glue the wings onto the back of the body to complete your butterfly. Option for mass-producing - older children: Omit the templates. Let the children cut out heart shapes in various sizes from colored construction paper (show them how to fold paper in half and then cut to make a perfectly symmetrical heart). Let the children create their own animals by putting together hearts of different sizes (you can pre-make a few example animals to give them some inspiration).